Ghosthunters: “DO NOT GO ALONE” to Adelaida Cemetery, Paso Robles! Unfortunately, the plot of the 2004 film Sideways, set in California’s central coast, was more concerned with the characters drinking and getting laid than in exploring the truly interesting attractions of the area. Some 14 miles west of the wine Mecca of Paso Robles is an historic burial ground that plays host to a singularly tragic, but harmless spirit, as well as a few more sinister ones. grow. A post office was established in 1887, and Mennonite Christians of German origin established a presence in the 1890s. Although William Antrim, Billy the Kid's stepfather, was formerly buried here, it is said that the cemetery’s most famous ghost was Charlotte M. Sitton, supposedly a Mennonite woman who met with horrible misfortune when both of her children died in a diphtheria epidemic. Most accounts relate that Sitton was so distraught over the loss of her children that she committed suicide. Although this is makes a good story, there has been no evidence uncovered so far that would lend credence to the tale. Several accounts relate that Sitton sunk into a depression from which she never recovered, and took her own life a few years later by either hanging herself in the schoolhouse, or taking poison. Many youngsters’ graves give 1887 as the date of death, which is probably the year that the epidemic raged through the little town. Sitton, who was nineteen when she shuffled off, died in 1889. Charlotte is supposed to make her appearance every Friday night anywhere from ten to eleven-thirty, either drifting through the tall grass and weeds in a white dress, or wandering about the headstones weeping for her children. This last element may be an Anglo variant on the Latino tale of La Llorona (The Crying Woman). The Adelaida Cemetery lies at the summit of a commanding hill amidst thousands of acres of fog-shrouded vineyards. 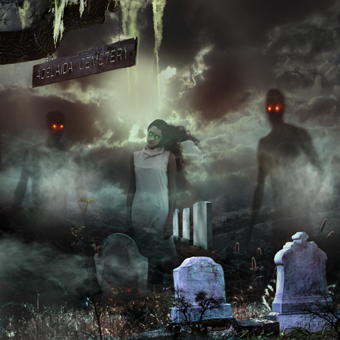 Despite their reputation, cemeteries are not prime areas for hauntings, but this lonely hillside has attracted the attention of amateur parapsychologists for years. They are not often disappointed. Upon entering the cemetery, the first thing a visitor will note is the thick strands of spanish moss hanging from the oaks, as if the place were custom-decorated for some sort of year-round Halloween party. Ghost hunters (and run-of the-mill thrillseekers) have reported shadowy, human-sized mists, furtive, glowing red eyes, and the sound of footsteps. Newly-bought or charged batteries fail, and EMF meters go wild. Cold spots come and go, and hooded black figures chase the adventurous. From Paso Robles, drive 12 miles west on Mountain Spring Road, which turns into Adelaida Road. Turn right on Klau Mine Road and continue about a mile north. The gates are on the right, near Chimney Rock Road. One of California’s many planned religious communities, Adelaida was a 19th-century Mennonite settlement nestled in the hills west of Paso Robles. Only the schoolhouse and cemetery remain today. Back in Adelaida’s heyday, a woman who lived there lost her children to diphtheria. Overcome with grief, she visited the community cemetery every Friday afterwards, placing flowers on their graves. But eventually her sorrow consumed her, and she died shortly thereafter. Versions of the story don’t agree on whether she hanged herself, took poison, or simply stopped eating and wasted away. Those who have investigated the accounts say that whatever the cause of death, the suicide was probably hushed up so that the woman could receive a Christian burial next to her beloved children.